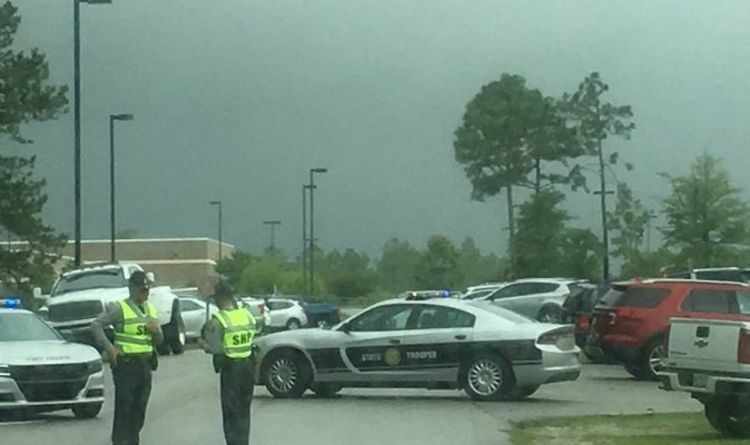 Offciers and a SWAT team are hunting for a gunman at Topsail High School in Hampstead, North Carolina. Unconfirmed reports suggest the shooter may be on the roof of the gymnasium. Once the scene was secured it came to light that the sounds were a malfunctioning water heater, accoriding to the county emergency management director. Told Collins said:"There's no active shooter. It's a malfunctioning water heater." He added that the series of water heaters popping "sounded just like an AR-15 (semi-automatic rifle) going off." Police Captian James Rowell said there were no reported injuries. This morning he briefed reporters: "Pender Sheriff’s Office is actively investigating a report of an active shooter at Topsail High School. There are no reported injuries. We will update soon." All of the schools in Pender County were on lockdown. Pedner County school board Chairman Kenneth Lanier told WECT News this morning: "At this time, all campuses on the eastern side of the county are on lockdown. Buses are being staged at Lowe’s Foods across from Topsail Elementary. All staff at Topsail Elementary, Topsail Middle, and Topsail High please report to Lowe’s Foods." Schools spokeswoman Miranda Ferugson said: "Buses for South Topsail Elementary, North Topsail Elementary, and Surf City Schools are being routed to their respective school campuses, where students will remain on lockdown on the school bus. "Parents who were planning to bring their child to school this morning should not do so at this time, as all schools are on lockdown." Numerous law enforcement officials were on the campus. Police recieved a call at 6:30am local time and officers then secured the perimeter. An emergency dispatcher told Time: "It's extremely busy right now. All of our units are trying to take this person into custody." It is not known if there are students already on campus as the first bell is a 8:20am. The editor for the Sanford Herald in South Carolina tweeted speculating that equipment could have made the gunshot-like noises. @FTNortonNews tweeted: "Reports of someone on top of Gynasium at Topsail HS firing shots into parking lot. "Source tells me Law enforcement trying to determine if someone was actually on roof firing shots. Multiple officers are on roof. "Faulty equipment at Topsail HS May have been source of gunfire sounds." The reports come days after a mass shooting at Borderline Bar & Grill in Thousand Oaks, Califronia that killed 12 people including a police sergeant. The high school went into lockdown in May after a student brought a semi-automatic rifle onto the campus because he believed he was going to stop a rumoured school shooting.